The Boston Hockey Blog reported that junior forward Cason Hohmann has had shoulder surgery to repair an injury that took place early in the season. Recovery should take three to four month, but Hohmann is expected to be ready for the 2014-15 season. On Friday, 2015 recruit Jordan Greenway scored a goal and added an assist for the U17s who dropped a 6-5 shootout loss to Chicago. The 6-3. 215 lb., left wing is fourth on the U17s in scoring with a 16-22-38 line. 2015 recruit Vas Kolias made his USHL debut Saturday night skating on the Indiana Ice blue line. He finished the game at +1. 2014 recruit Jack Eichel scored a goal and an assist in regulation and then scored a shootout goal to help the NTDP U18s edge Omaha, 4-3 on Saturday. The next day, he assisted on two goals and scored another shootout goal in a 4-3 win against Muskegon. Eichel He leads the U18s in goals with 33 and points with 75, and is co-leader in game-winning goals with six. Eichel continues to move up the NTDP career scoring charts and now is seventh in points (127) and eighth in goals (62). Eichel is joined by 2014 recruit Johnathan MacLeod (photo) and 2015 recruit Charles McAvoy on USA Hockey’s entry list for the upcoming IIHF World U18 Championships. Team USA’s roster will be selected from the entry list. The World U18s will be played in Finland, beginning April 17. 2016 recruit Clayton Keller led the all scorers at the NTDP evaluation camp and reportedly has been invited to join next year’s U17 squad. Keller, with 67 points (31G, 36A), is second in scoring for Shattuck St. Mary’s Prep, which will be a favorite in the upcoming Tier 1 18U nationals. 2014 recruit Chase Phelps is also a top SSM scorer with a 23-38-61 scoring line. OverTheBoard offered profiles of the top players in the recently concluded Massachusetts Super 8 tournament, including 2015 recruit Bobo Carpenter (photo), who led Austin Prep to the tournament championship game. The son of former NHLer Bobby Carpenter plays a well-rounded game. Just as effective with the backcheck as he is on the rush in the offensive zone. Doesn’t need many offensive chances to find his way onto the score sheet; hard to take the puck off his stick and possesses a strong wrist shot. Consistently takes the puck to the net with speed, starts rushes from the opposing goal line and sets up shop at the point on the PP for Austin Prep. Will take key face offs in the defensive zone if the team needs to win possession. Plays best when his team needs him. In advance of its final draft prospect rankings, NHL Central Scouting published lists of the top 10 2014 draft prospects in various leagues and regions. Three Terrier recruits made the lists: Carpenter (USA East), MacLeod (USA West) and Spruce Grove defenseman Brandon Hickey (Canadian Junior A). Nick Bonino (photo), recently promoted to Anaheim’s top line, scored 35 seconds into the Ducks’ game in Edmonton—recording the 19th goal of his breakout season. Edmonton edged Anaheim in overtime, 4-3. Alex Chiasson’s 13th goal of the season was the game-winner for Dallas, which drubbed Nashville, 7-3, on Friday night. Kevin Shattenkirk assisted on two St. Louis goals, in the Blues’ 4-2 loss to Dallas, Saturday night. The two points gave the former BU captain and All-American a new career high of 44. Charlie Coyle scored his 10th goal of the season for Minnesota in the Wild’s 5-2 loss to Vancouver. When Team USA and Team Canada face off today in the IIHF Women’s World U18 Championship, three 2014 Terrier recruits will be on the ice and a BU coach will be behind the Team USA bench. Goalie Erin O’Neill backstopped two US wins in the preliminary round. For Canada, forward Victoria Bach is the top goal-scorer (4G, 2A), while Rebecca Leslie has two goals and three assists. BU assistant coach Katie Lachapelle is serving as an assistant to U.S. head coach Jeff Kampersal. The first four seasons of Jack Parker’s tenure as BU’s head hockey coach ended the same way: An ECAC championship followed by a deflating loss in the NCAA semifinals. In 1977-78, the script changed. While the Terriers failed to defend the ECAC title, they would complete a remarkable 30-2-0 season by winning the third national championship in program history and the third in eight seasons. 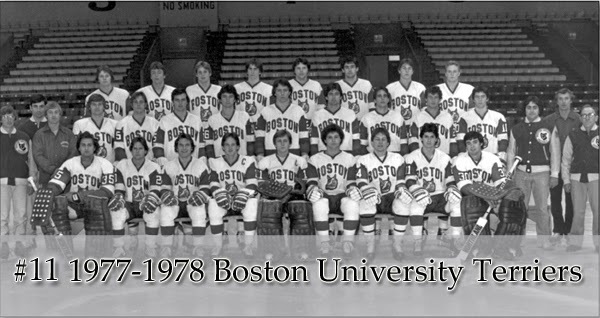 Thirty-six years ago today, in the only national championship game played by two schools located on the same street, BU defeated BC, 5-3, at the Providence Civic. Two days after dispatching defending NCAA champ Wisconsin, 5-2, the Terriers overcame an early Eagle lead on the strength of two goals apiece by top scorer Mark Fidler and Tony Meagher. Three future 1980 Olympic gold-medalists also had a hand in the victory: Dave Silk knotted the score at 2-2 in the first; Jim Craig turned aside 28 BC shots; and, co-captain Jack O’Callahan (photo) earned Most Outstanding Performer honors. The season had featured a 21-0 start, a Beanpot championship game (BU 7 Harvard 1) delayed nearly three weeks by the Blizzard of ’78 (BU beat BC 12-6 that night) and a clutch 5-3 road win against Providence in the NCAA play-in game that put BU in the Final Four for a fifth straight year. With two points against Youngstown this past Sunday, 2014 recruit Jack Eichel moved up to eighth place on the NTDP all-time points list with 123, moving past ex-Terrier Matt Nieto and Peter Mueller. Nieto recorded his 14th assist in the Sharks’ 2-1 shootout loss to Calgary. He now has 24 points in his inaugural NHL season. Alex Chiasson picked up his 19th assist of the season in Dallas’ 2-1 win against Winnipeg. The former BU MVP has a 12-19-31 scoring line for the Stars. The Daily Free Press talked with Head Coach Brian Durocher--who was a co-captain of BU's 1978 national champs--to review the Terriers’ season that culminated with a third consecutive Hockey East Championship and a fifth straight appearance in the NCAA tournament. When Union College defeated Colgate Saturday night for its third consecutive ECAC Tournament title, it became the first school to do so since BU—then an ECAC member—won four straight titles (1974, 1975, 1976 and 1977) during the first four years of Jack Parker’s tenure as BU’s head coach. BU had also won the title in 1972, giving the Terriers five titles in six seasons. 2015 recruit Maxim Letunov (photo) scored three times in a pair of weekend games. In Youngstown’s 7-3 win against the NTDP U17s on Friday, he earned first star honors with a pair of even-strength goals , while 2014 recruit J.J. Piccinich added an assist. Saturday, Letunov’s power play goal and an assist by Piccinich on another goal gave the Phantoms a second-period lead over Indiana, but the Ice rallied for a 4-3 win. 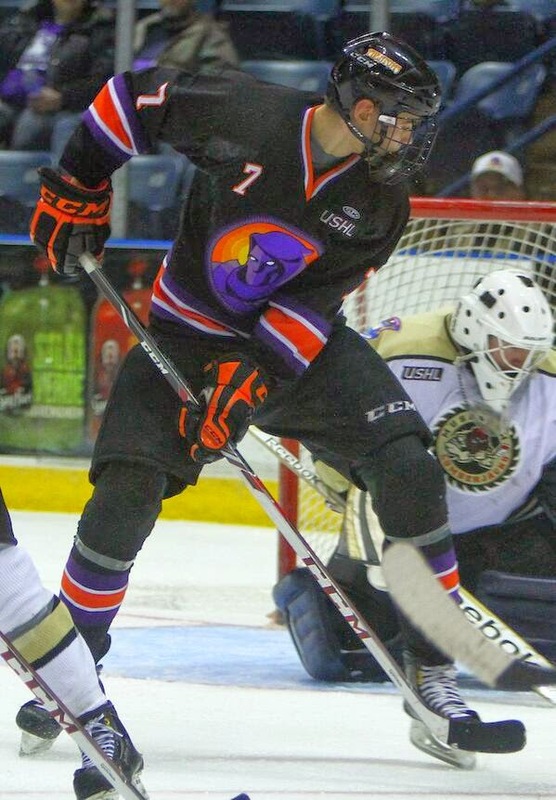 Letunov, who is third on the Phantoms in scoring, has a 19-23-42 line.UPDATE: Letunov recorded an assist and Piccinich had two helpers in the Phantoms' 5-3 loss the U18s Sunday night. 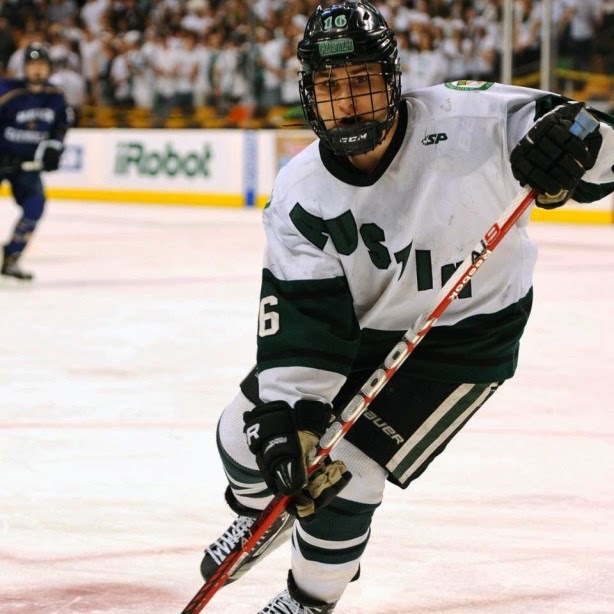 2015 recruit Bobo Carpenter, who had led Austin Prep to the Massachusetts Super 8 Tournament finals, scored his first USHL goal on Saturday in Sioux City’s 5-2 win against Omaha. On Friday night, he registered an assistance in the Musketeers’ 7-1 loss to Sioux Falls. 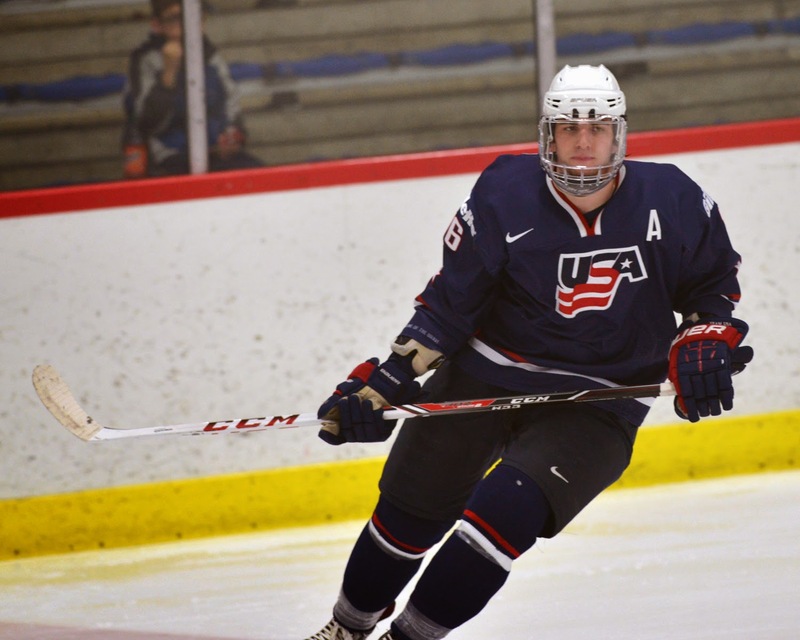 2014 recruit Jack Eichel assisted on a power play goal and a short hander as the NTDP U18s defeated Chicago, 5-2. With the two assists, Eichel takes over the NTDP U18 scoring lead with a 32-37-69 scoring line. UPDATE: Eichel assisted on two goals Sunday in the U18s 5-3 win against Youngstown and now has a team-high 71 points. 2015 recruit Vas Kolias, who played this season for the Chicago Mission 18U team, is now on the roster of the USHL Indiana Ice. The 5-9, left-shot defenseman from Schaumberg, Ill., was drafted by the Ice in the second round (21st overall) of the 2013 USHL Futures Draft and is expected to play for Indiana next season. Charley Coyle’s 8th goal of the season pulled Minnesota even with Detroit at two apiece, but the Red Wings came away with a 3-2 win. Ryan Whitney (photo), who has spent most of this season with AHL San Antonio—along with Matt Gilroy and Wade Megan—was recalled by Florida and skated in Sunday night’s 6-2 loss to Anaheim. Megan scored his 8th goal of the season and added an assist as San Antonio doubled up Charlotte, 4-2. Two goals by Corey Trivino and one from Ben Rosen helped ECHL Stockton edge Alaska, 5-4 in overtime. Trivino also contributed two assists, giving him his first four-point game as a pro, while Rosen also added a helper. Sophomore Sarah Lefort was named an ACHA Second-Team All-American following a standout season in which she leads the nation with 32 goals and is fifth in overall scoring with 55 points. She's the second Terrier to achieve All-American honors. Catherine Ward, who skated for Canada's gold-medal Olympic squad in Sochi last month, was a second-team All-American in 2011. A trio of Terrier recruits played pivotal roles in opening game wins for Team USA and Team Canada in the IIHF World U18 Championships in Hungary. 2014 recruit Erin O’Neil stopped 16 of 17 shots is the U.S. opened the tournament with a 6-1 thumping of Russia. 2014 recruit Victoria Bach earned player of the game honors with two goals and an assist in Canada’s 7-1 defeat of Japan. 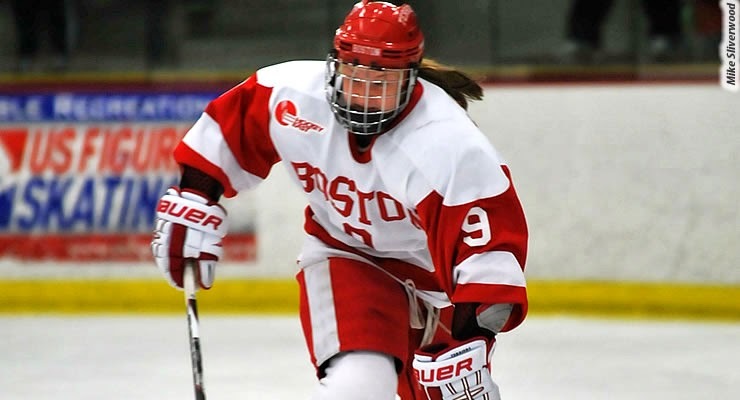 Bach scored the game’s first goal and later added a short-hander, while fellow 2014 recruit Rebecca Leslie scored a power play goal. Prior to joining Team Canada, Bach had led the Provincial Women’s Hockey League in scoring with 68 points ( 36G, 32A) in 35 games, while Leslie had a 24-27-52 line in 38 games.